WWA Info Exchange • View topic - Get Your Sunglasses Out!! Post subject: Get Your Sunglasses Out!! 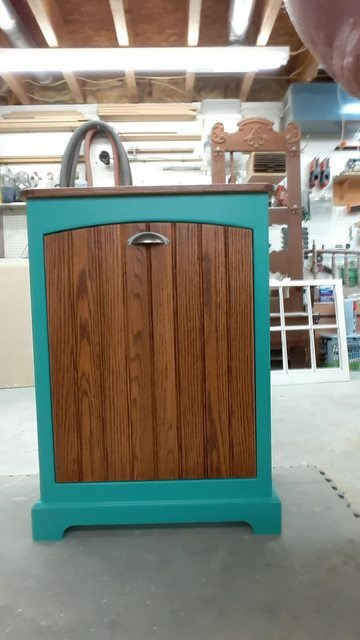 My customer wanted a trash cabinet painted a "Pretty Turquoise" Well, here it is! Please excuse the pictures. My camera broke and I had to use my cell phone, and, as you know, I'm technologically challenged", in other words, I'm not a teenager! Post subject: Re: Get Your Sunglasses Out!! That is REALLY fine, Larry! 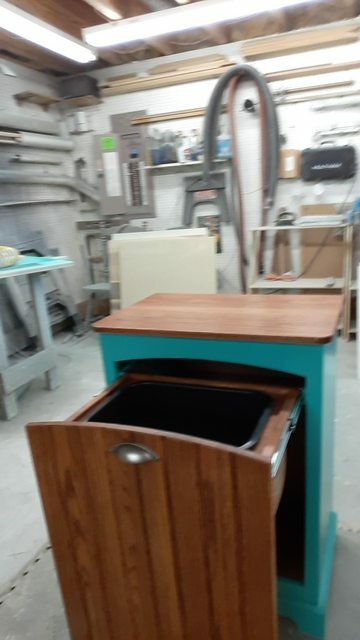 You've definitely mastered the design & painting of that Bin! I love it. Thanks for letting us see it! May I steal your design & make on for myself?? Absolutely, Don! But you will have to pay me $10,000 to use it! Thanks, Ron! Have you decided when you're coming to work for me? And in addition to a very high salary of $2.00 an hour, you also get a full benefit package. It's your benefit to work for me!! And when I become the greatest woodworker of all time, you can say you work for me! Looks great Larry! I like the arch. It really sets it off. what's wrong with turquioise? It's the state color in NM (or at least seems to be). Very common on doorways, window frames, etc.